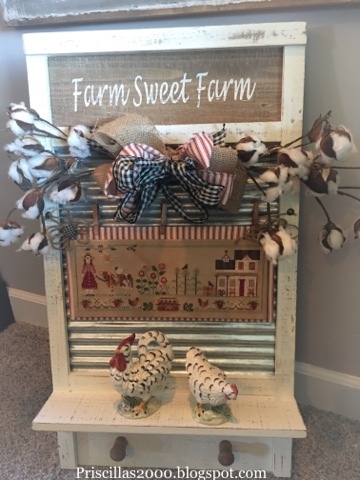 Yesterday in our video we showed you this finish of The Farmer's Daughter from Little House Needleworks..My daughter stitched it and I finished it for her...She stitched it on 28 count coffee/ tea dyed fabric with the called for threads but left out the Farmer's daughter words at the top.. 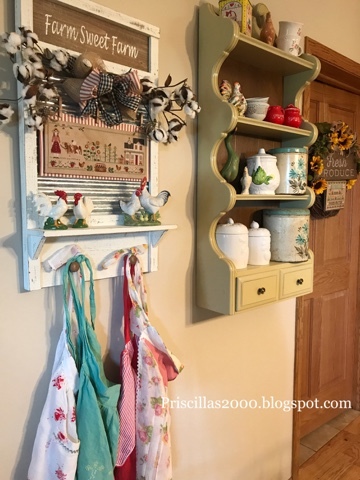 Here it is in her kitchen with aprons hanging from the pegs.. I mounted the stitching on sticky board..then mounted red ticking stripe onto another piece of sticky board. I glued them together and added magnets to the back to attach to the metal on the frame .. The frame came from Hobby Lobby.. 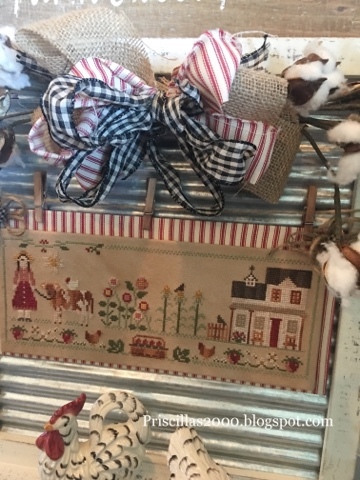 I used 2 stems of cotton and made a bow from burlap , the red ticking and black check..I also used magnets on the back of this bundle to attach to the frame, so I didn't glue anything on in case she wants to change it out.. The clothespins are weak so just for decoration .. I also added twine flowers in the top corners with a black homespun check covered button..
Oh I love it! I saw the sneak peak on the video but it's just too cute in these photos! 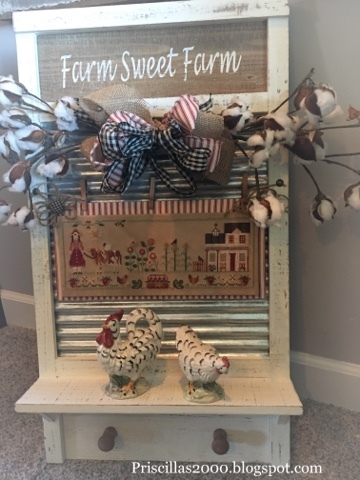 I need to channel your finishing inspiration for my Country Cottage "Peter Peter" SAL - I'm stumped! Love, love, love your videos too!! My want to stitch list is a MILE long! Lol's. Since Chelsea likes chickens so much this is perfect for her. Love the finish and the way she can switch this out. Love it, it looks stunning. Looks wonderful with the aprons hanging on it.Love, love, love :)P.S. the chooks look great . What a clever way to display her stitching. The aprons add to the overall design! Love this display. So Perfect! How many extra inches do you like to you have on the sides for finishing? I LOVE this!! So cute!! What a great idea!! I love this!! What a great idea!! Thanks for sharing! !